Here is the summary as at 30th April 2017. The average stock tip has delivered 24% return Inception to date, with 88% of my 27 tips in profit. On an annualised basis the average tip is 366%. Regarding Berkeley Energia (BKY), the market was spooked by a bearish broker note, the exit of BlackRock as an investor (likely following the research note) and the lack of further financing news for the completion of the mine. 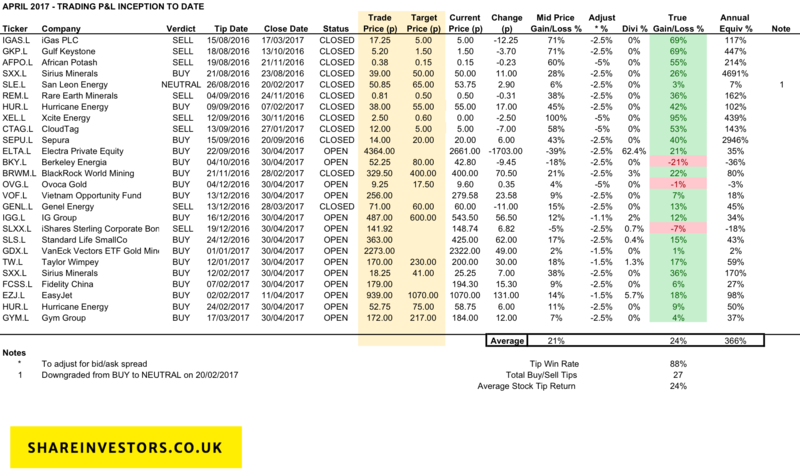 I wrote an article a few days ago here explaining why I still believe a share price target of 71p is achievable though. Regarding Sterling Bonds; I have seen nothing to indicate that my belief of a due correction is incorrect. Patience required here in my opinion. On the portfolio boosting side, Sirius Minerals looks finally clear of the placing overhang and the share performed well on positive construction news and a move to the main market. The EasyJet position was closed in the month after reaching my target and returning investors a respectable 18% in 2 months, i.e. 98% on an annualised basis. Previous Previous post: Berkeley Energia, recent weakness in share price. Is it still a buy?